If you’re a professional photographer that takes holiday photos and markets holiday greeting cards, or a pro that would like to start such a business, then this PhotographyTalk.com article is for you. As a professional photographer, your revenues are limited by the number of hours in the day and the number of clients you can shoot during those hours. That is why most photographers must offer additional products, in the form of prints, albums or holiday greeting cards, to generate sufficient revenues. 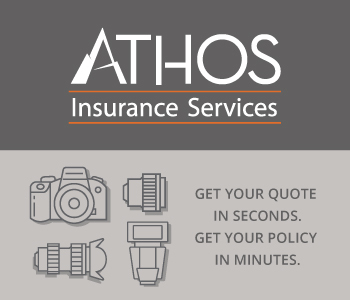 For example, wedding photographers rely on the markups on prints and albums much more than any hourly rate. When it comes to holiday greeting cards, it only makes sense that you should capture that business from the clients that ask you to shoot their holiday portraits, for the express purpose of putting them on cards. The challenge is to photograph more clients and prepare more cards in the same amount of time, which, in turn, increases your revenues. Many pros discover that they must spend a huge amount time sitting at the computer, designing holiday greeting card for each of their clients, and then producing their orders. Considerable amount of time is also spent sharing proofs with clients, making any corrections or adjustments, and then sending another proof. If this describes your holiday greeting card business, then card-design templates may be the best solution, instead of providing each customer with a custom design. You can offer template-based packages at a competitive price, and then create a new pricing level, for custom designs, which will also boost your revenues. Templates also allow you to process/prepare many more customer orders in less time. Plus, you eliminate much of the back-and-forth proofing and correcting that is required with custom designs. With the time you’ll save using templates, you’ll be able to book and photograph more clients, which become more holiday greeting card orders. In addition, creating customer orders with holiday card templates doesn’t require as much Photoshop knowledge or experience as custom designs, so you may be able to hire a part-time person at a much lower hourly rate, freeing you to photograph more clients. Because you can produce customers’ orders faster with templates, you can offer quicker turnaround time, which becomes a competitive advantage and helps you retain more customers for future business. Your customers won’t be very happy with a very limited number of holiday greeting card templates, so you want to do business with a template vendor that offers an excellent variety of holiday templates. Better yet, look for a vendor that also has hundreds of templates for many other greeting card occasions: graduation, anniversaries, baby arrivals, etc. There is no reason why you shouldn’t be capturing that business too. Template vendors who provide tutorials for using their templates are definitely interested in helping you drive more sales. With that training, the part-timer you hire will be productive sooner, and make fewer mistakes that must be corrected. When considering holiday greeting card template vendors, be sure to compare their prices to the quality of their templates, the selection of their templates and how well they support your business. One of the few greeting card vendors that fulfill all these criteria is Posh Prints & Designs by Melissa Waller at poshprintsanddesign.com. A quick visit to its Web site reveals a great selection of holiday templates as well as hundreds of other templates, albums, books, boxes, cards and extras. Posh also offers a low-cost Digital Design Class with Cooper Photoshop Templates. Posh proves they know your business by offering a Christmas in July set of Photoshop templates. Summer is the time to be booking those holiday portraits and family pictures and prepare, process and deliver orders when your customers want them. Posh Prints & Designs Christmas in July template set has been specially priced for those pros that know why it’s important to do that business now. The complete set is only $100 for a limited time – $300 off the regular price. 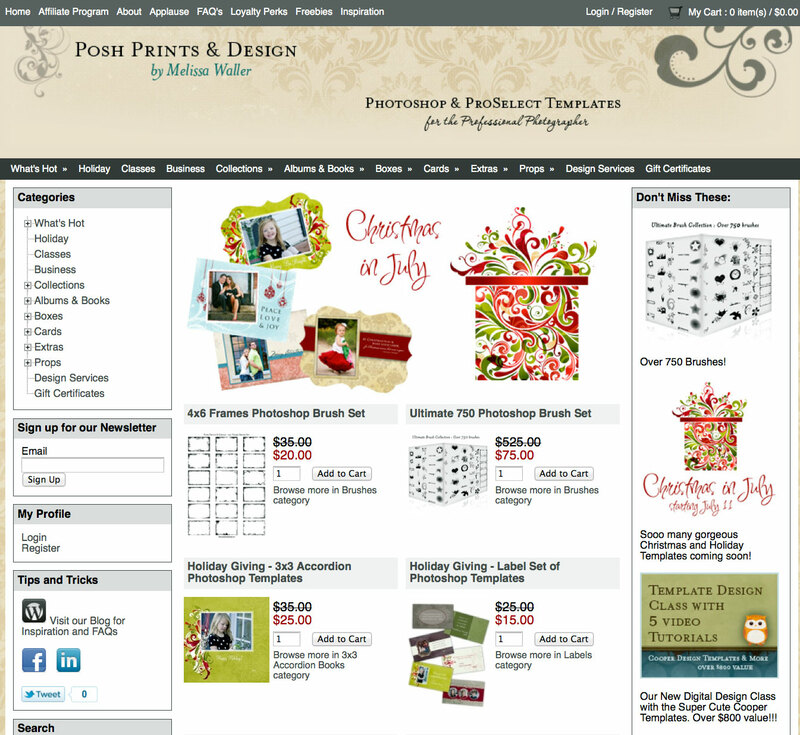 This is the year you maximize your holiday greeting card revenues, and it starts with a visit to poshprintsanddesign.com. Swing on by today and don’t forget to use coupon code: photographytalk10 for 10% off any template all year long!